Heat oven to 325°F. In large bowl, combine sugar and butter; beat until well blended. Add almond extract and egg; blend well. Add flour and cocoa; mix well. Shape dough into 6-inch-long roll. Cut roll into 6 slices; cut each slice into quarters. For each pretzel, shape 1 dough quarter into 10-inch-long rope. Shape rope into U-shape; cross ends and place over bottom of U to form pretzel. Place 1 inch apart on ungreased cookie sheets. Bake at 325°F. for 8 to 10 minutes or until set and firm to the touch. Cool 1 minute; remove from cookie sheets. Cool 10 minutes or until completely cooled. In small microwave-safe bowl, combine chocolate chips and shortening. Microwave on HIGH for 30 seconds. Stir; continue microwaving, stirring every 10 seconds, until chocolate is melted and can be stirred smooth. 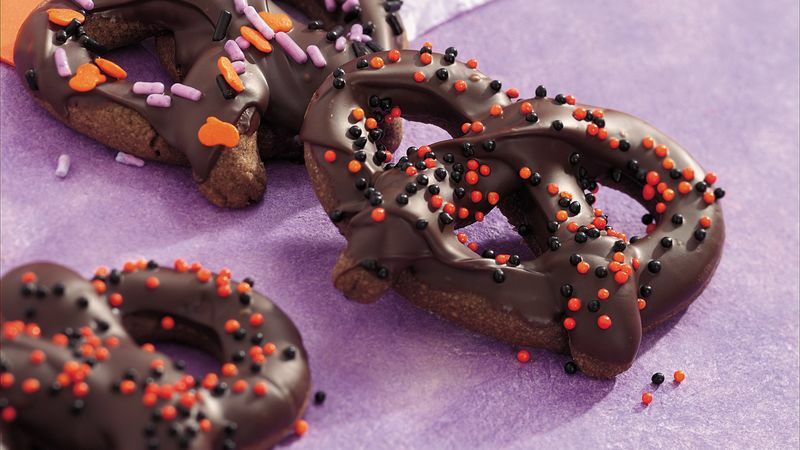 Dip tops of pretzels in chocolate. Sprinkle with candy sprinkles. Refrigerate 10 minutes or until chocolate is set before storing. Cocoa is notoriously lumpy. Before adding the dry ingredients to the dough, whisk or sift them together. Shape pretzels with just-mixed, room-temperature dough. Not enough time? The dough may be refrigerated for a later use, but let it warm to room temperature before handling. Let the chocolate icing set completely before layering the cookies between waxed paper in an airtight container.